Bought my new car last Sunday and have been enjoying it immensely. 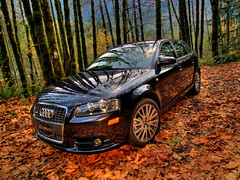 I decided to splurge and go for the Audi A3. I fell in love with it after test driving it. I think I test drove 3 of them before I decided to buy it. I went with the 2007 model, it was the last one in stock and they were trying to get rid of all their 2007 inventory so I think I got a pretty good deal on it. I took this photo last Tuesday along Rieter Road between Index and Gold Bar. It does not play mp3 CD's or auxiliary output. However it does have a tape deck so I can use one of those cassette tape adapters, if only I could find mine.